Urban Simplicity: Peace. Free Stuff. "What's so funny 'bout peace, love, and understanding." Precarious. That's the word that came to mind this morning when thinking about the times in which we live. That could also have been a good descriptor of my emotional state as I rode my bike to a coffee shop. Has the world and everyone in it gone insane? There is just so much darkness. So much disconnect. Yesterday's shootings are just the tip of the iceberg; just one in many destructive things that are happening as I type these very words. And then I came upon the scene pictured above. 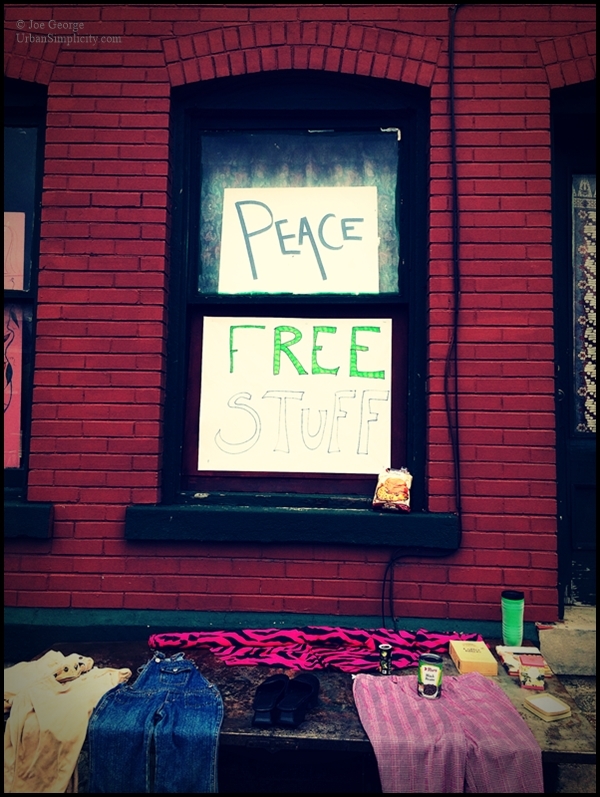 An apartment on South Elmwood Avenue here in Buffalo with a table out front on the sidewalk. A few odds and ends; nothing of any real value. But rather than throw them in the trash they took the time to set up a table, lay the items out, and make a sign...Peace; Free Stuff. They took the time to offer this stuff to someone who may need it. It brought a smile to my face then just as it does now. And it made me remember that there is still good. With all the recent events I will be honest and say that I feel somewhat helpless. How can I possibly make a difference in this world. A difference in anything. And then I saw this and it made me remember. It made me remember that goodness can happen in really small steps. The words of a local and inspiring retired clergyman, the Reverend Phil Smith, came to mind (and I'm paraphrasing)..."America is really good at waging war, the best in the world in fact, but what we really need is to wage peace." Our society is seriously broken. And by "our" I don't just mean American. We really need to do something, but what? What can we as individuals do to make a difference? What came to me was that we as individuals do need to wage peace at a personal level. Simply being nice to people in your own little world, regardless of their gender, skin color, or religion. Help people whenever you can. Maybe it can have a ripple effect. I really do worry about the next generation, my son's generation. And his children's generation after him. And I'd be lying if I didn't say I am waiting for the next MLK or Gandhi to appear to inspire us into a revolution, to change things and turn us around to face things differently...to wake us up. Though I'm not sure we'd recognize the next prophet if they did appear on the scene...we don't have enough space for them. But I also think how it can be us. It can be us to make small changes each day to make ourselves as a society that much more...well, societal. If we did this maybe it would stop that one person from doing something terrible. Maybe it would stop that one single person and make them think that they shouldn't do the terrible act they had in mind. Maybe it would soften their heart enough to see the consequences. Maybe it would make them realize that they are loved and they themselves can in fact be love. And if our kindness changed even one single person that would be enough. But then maybe it would have a ripple effect. We, as collective consciousness, really need to look within. It's not us against them, or vice versa. It's just us, the people of planet earth. We really need to do this if we want to survive. "This is my commandment: that you love one another, as I have loved you."